After a rocky first few weeks to begin the season, the bullpen has settled in these last two months and become a strength for the Yankees. Aroldis Chapman has been nails in the ninth inning and the Dellin Betances/Chad Green setup duo has been great as well. David Robertson has bounced back from his little hiccup last month and Jonathan Holder has emerged as a reliable middle reliever. Aside from eighth reliever A.J. Cole soaking up a precious roster spot and never ever pitching — he last pitched on May 28th, if you can believe that — things are going well for the bullpen right now. And the Yankees are going to need the bullpen to continue pitching well because the starting rotation, despite their recent excellent work, is not a strength. Sonny Gray has been inconsistent at best and Domingo German and Jonathan Loaisiga are rookies. Starting pitching will be the focus prior to the trade deadline and rightfully so. Jordan Montgomery is not coming back, and unless Gray turns back into the Oakland A’s version of Sonny Gray very soon, he’s tough to count on for a quality performance every fifth day. As good as the rotation has been lately — the starters have a 2.72 ERA (3.38 FIP) in June — the Yankees have a clear need for another starting pitcher in my opinion. Do the Yankees need another reliever as well? Well, no, the Yankees don’t need another reliever. But is the bullpen something that can be improved at the trade deadline? Of course it can. Bullpens are more important now than ever before, and come postseason time — assuming the Yankees get there, of course — when every inning is a high-leverage inning, the more quality relievers, the better. Some thoughts on a potential reliever addition. On one hand, the Yankees do not have a single reliever in the top 25 in relief appearances this season. On the other, they have three dudes on pace for 70+ appearances, and that’s a lot. I’ve been a baseball fan long enough to know reliever usage is volatile. 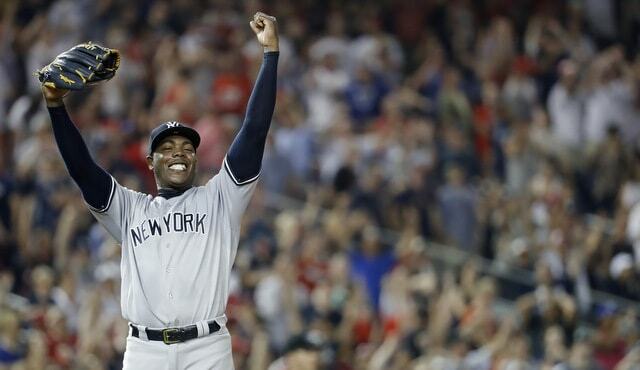 Chapman pitched for the eighth time in 16 days last night, and before you know it, Aaron Boone will be looking to get him into a game this weekend because he needs work. There are always those long stretches of inactivity. Even still, adding another top notch bullpen arm to lighten the load on everyone else wouldn’t be a bad idea. Shreve has reverse split and yet we’ve seen Boone use him in left-on-left matchup situations several times, most notably last week against the Nationals, when Boone let Shreve throw a second inning because several lefties were due up. Juan Soto, a left-handed hitter, hit what proved to be the game-winning homer. Sigh. Now, just because the Yankees only have one non-Chapman southpaw in the bullpen, it does not necessarily mean they should added a lefty reliever. Their righties are very effective against lefty batters, specifically Betances, Green, and Robertson. In a high-leverage spot with, say, Andrew Benintendi at the plate, I want one of those guys on the mound rather than a lefty who is out there just for the sake of the left-on-left matchup. Would adding a left-handed reliever be worthwhile? Sure. It’s good to have variety in the bullpen and there are times when getting that left-on-left matchup makes sense. If the Yankees get another reliever, it doesn’t have to be a lefty because the righties are so good at getting out lefties. It wouldn’t hurt to add a southpaw though. 3. A rental would be a-okay with me. Years of control is a big obsession in baseball these days. Teams don’t just want to add good players, they want good players they can keep around for several years. And that’s great! Makes perfect sense, no? It generally costs more to acquire those players, but that’s okay. You get them longer. One of the reasons the Yankees traded for Sonny Gray was his two and a half years of control. If the Yankees add a reliever, I don’t think targeting someone with control beyond 2018 is imperative. It’d be nice, but it’s not necessary. The goal — and this applies to any trade for this Yankees team, really — is putting the 2018 team in the best position to win the World Series. If you can get someone under control long-term, great. But give me the best player for the 2018 Yankees, first and foremost. Rentals are generally cheaper and there’s no long-term risk. They’re underappreciated in today’s game, I think. 4. Are internal options better? The Yankees do have Tommy Kahnle and Cody Carroll stashed with Triple-A Scranton, remember. Justus Sheffield could be a bullpen option too. Ditto German or Loaisiga once Masahiro Tanaka returns from his duel hamstring injuries. So I guess the question becomes this: Is it worth using prospect and luxury tax payroll capital to get a reliever when you have those guys already in the organization? For me, the answer is yes. Depends on who the Yankees would be acquiring, of course, but the answer is yes. As long as Shreve and the seldom used Cole are on the MLB roster, and Kahnle’s throwing 95-96 mph rather than 98-99 mph, and Carroll and Sheffield have zero big league time, the answer is yes. Acquire a reliever and he’s an upgrade over someone. The Yankees would be making their organization stronger. They have internal bullpen options. There’s also nothing wrong with adding to a strength. 5. Who are some potential bullpen targets? Kelvin Herrera came off the market yesterday when he was traded to the Nationals in the middle of last night’s game. Brad Hand is the top guy on the market now. He is under control through 2021 and excellent. Zach Britton and Brad Brach are both rentals who may not be viable options for the Yankees given the whole intradivision thing. Jeurys Familia is another rental and guys like Blake Treinen and Raisel Iglesias figure to be out there. They’ve been great.
? Ottavino was terrible last season and, as Travis Sawchik explained, he basically rebuilt himself in a vacated storefront in Harlem over the winter. Pretty neat story. Ottavino has been excellent this year — he’s had very good seasons in the past too, so he’s not necessarily a one-year wonder — and the Rockies are fading out of the postseason race. Would they make Ottavino available at the deadline? Trade for him and he might jump at an extension to stay close to home too. “This team has earned the right to get reinforced here if we can possibly find a way. But we certainly like the team we’ve got and would certainly love to make it better, if possible,” said Brian Cashman in perfect GM speak to Dan Martin over the weekend. Does the bullpen need to be fixed? Nah. Can it be improved? Of course. There’s always room for improvement. The Yankees lean on the bullpen heavily and anything they can do to strengthen it is worth exploring. As far as I’m concerned, getting another starting pitcher is the top trade deadline priority. As good as the starters have been lately, I’m not especially comfortable with the rotation as is given CC Sabathia’s knee, Tanaka’s hamstrings and elbow, German’s and Loaisiga’s greenness, and Sonny’s Grayness. The rotation needs to be solidified. The bullpen can improved too, and it’s not an either/or situation. They can work to improve both at the same time. Another reliever isn’t absolutely necessary. It is something worth considering though.